Can Dent Vanish help me with my LEASE RETURN vehicle? The most important benefit is quality. This method is the closest you can get to the dent never happening in the first place. No grinding, bondo, fillers, or primers are needed because your original factory paint is not disturbed. There are no problems with filler or paint shrinkage months after the repair as is typical with most body shop repairs. Cost is also a major benefit of PDR. A typical estimate for a minor dent from a body shop usually ranges between $350 - $500 or higher. 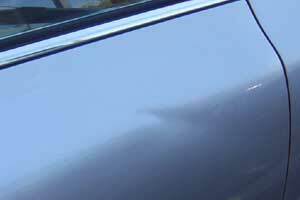 That same dent can usually be repaired for $75 - $95 using PDR. Time savings is yet another advantage. That same dent can be fixed in less than an hour. A body shop will take 3 - 5 days or longer. On minor dents, in most cases yes. The deeper the dent, the more difficult it is to repair. Even on larger dents, once we're done, most people are amazed at the results. We always explain in detail, how your dent will look before any work is started. Absolutely not. Once a dent has been removed properly with PDR, it never comes back. Most dents repaired conventionally develop a ring around the dent, or sand scratch marks 3 - 6 months after the repair. This is never the case with properly performed PDR. No. The most important factors in determining if a dent can be repaired by PDR are depth and location. Dents the size of a dinner plate or larger can be fixed successfully, as long as they are not too deep. On the other hand, some dents that are as small as a dime but very deep, cannot be fixed using PDR because the metal is too stretched. Cracked paint can also be an indication that a dent is too deep. The most common dents fixed are the size of a golf ball and under. 95% of minor dents can be repaired. About 5% of minor dents can't be fixed due to depth or location. Areas such as some quarter panel opening lips, some forward areas of heavily braced hoods, or the very edges of some panels are examples of bad locations. It has become common practice by many PDR technicians to drill or punch holes in places like door frames, quarter panel jambs, inner wheelhouse panels etc to gain access to a dent with their tools. Most of the time the customer is not even informed of this. I have seen "repairs" where as many as 7 - 10 holes were drilled to access one dent. Dent Vanish will always take the extra time to try and repair a dent without drilling. In the event that there is no other way to repair a dent except to drill a small hole, or if it is less expensive to drill a small hole, you will always be advised of this and the choice will be yours. If a small hole is necessary, it will be rust-proofed and plugged. No, we don't. There are too many quality problems with the quick mobile paint repair systems. If your vehicle needs paint work, I'll be happy to refer you to a quality paint shop in your area. We sure can. We can remove those dents for a lot less than you will be charged for "excessive wear and tear on your vehicle's exterior". If your lease is up soon give us a call, you'll be glad you did. Ever hear the saying "Image is everything"? Most people judge a car by its appearance. If it looks good they assume it has been well taken care of. Used car dealers and wholesalers know this. They also know what they spend on PDR will make them many times over what they spend, and will help them sell the car quicker. If you're selling your car, PDR is one of the best ways to get top dollar, more interested buyers, and a quicker sale. .